Need a Wichita Plumber? Try these area plumbing professions for problems with water pipes, drains, sump pumps, sewer lines, shower head replacements, sinks, septic tanks and more. Wichita plumbers are here! Our licensed plumbers are here to service both residential and commercial plumbing issues. Whatever you need: plumbing, irrigation, landscaping or fencing, Reddi Industries is always ready to help. 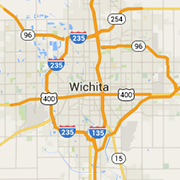 Solving your plumbing, sewer and drain problems in Wichita KS and the surrounding area. No overtime!